Here at ARB Maroochydore, we are committed to providing you with the very best 4WD products, accessories, and advice to get you on the road and travelling safely and comfortably. As such, we’re very excited about a special promotion we’re running until May 5th, 2019. Between now and May 5th, when you purchase an Old Man Emu suspension kit from ARB Maroochydore, you can enter our draw for a chance to win one of four fantastic prizes, each of which is valued at more than $75,000! So what are you waiting for? Come on down to the store and have a chat to the team which will help you find the perfect Old Man Emu suspension kit for your needs, as well as anything else you need to get you out on the road! ACTION: The Extreme Power Sports Package includes the KTM 250 EXC Dirt Bike, the Seadoo RXT-300, and the Polaris RZR XP Turbo Buggy – extreme action for extreme fun! FAMILY: The New Age Desert Rose Caravan is ideal for travelling with the family in comfort and style. It is an 18ft (6-metre) van which includes features and fittings such as an oven, stove, microwave, fridge, TV, reverse cycle air conditioning, heating, double bed, shower, and even a toilet! ADVENTURE: The ARB Enhanced Sniper X Camper Trailer is an extreme off-road home away from home. It has been designed and built for remote peninsula and outback travel and features Old Man Emu off-road shock absorbers, two ARB 60L fridge/freezers, outdoor pantry and kitchen, Redarc 12V power, and a 4-metre awning. FISHING: Anglers will fall in love with the Formosa Sea-Rod Classic Boat, great for fishing in ocean, lakes and rivers. The Formosa Sea-Rod Classic is powered by a Honda 150 outboard motor and a Minn Kota Ulterra self-deploy electric motor. It has a full-plate 4mm aluminium hull, Garmin electrical gauges, GPS and UHF units, a fish finder, and a Fusion marine stereo system. Old Man Emu Suspension is the gold standard for fully-integrated 4x4 suspension on Outback roads and in harsh conditions and it Australia’s leading brand for 4x4 suspension. It is designed for unparalleled performance across all types of terrain, and when you invest in an Old Man Emu Suspension upgrade from ARB Maroochydore, you’ll marvel at the noticeable improvements in your vehicle’s performance, for everything from control to load capacity. There is a suspension product to suit every vehicle and every need – so come and have a chat with us at ARB Maroochydore for the finest in product range and expert advice. The Intensity V2 lights are the perfect addition to your 4WD. Learn more or come in store. 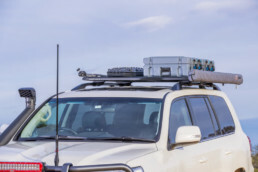 Bull Bars are essential for the safety of you and your 4wd in highway, rural and remote-area travel, even more so when you take your 4wd off-road. Bull Bars offer by far the best form of vehicle protection against animal strikes and other collision types. Here we explore the basics you need to know when it comes to Bull Bars. What is a Bull Bar? A Bull Bar is a simple but extremely effective addition to the front of a 4WD vehicle. Available in a variety of shapes, sizes, and materials including steel, alloy, and even plastic, a Bull Bar will also provide protection when driving off-road, against logs, banks, scrub, and similar obstacles. Why You Need a Bull Bar? Human Safety – with a Bull Bar, the high energy of an impact with an animal is prevented from dissipating throughout the entire vehicle. This reduces damage to your 4WD, even more importantly, it protects the people travelling inside of the vehicle. A quality bull bar is a potentially lifesaving addition to your 4WD, Ute or SUV. General Protection – a Bull Bar offers general protection to your vehicle both off-road and also on tarred or paved roads. This includes protection from rocks, sticks, ruts, logs, and also in minor accidents where a front-on collision with another vehicle or object takes place. Animal Collision – if you hit an animal such as a kangaroo, especially at speed and without a Bull Bar, your vehicle will in all likelihood be damaged severely and even potentially be written off. A Bull Bar greatly mitigates this risk and protects your investment. Mounting Point: a Bull Bar provides a perfect mounting point for winches and other accessories such as UHF antennas, driving lights, and sand-flags. ARB Bull Bars are engineered to factor in vehicle design, air-bag deployment, crush-rate, accessory fitting availability, approach angles, weight, strength, and more. Airbag-compatible Bull Bars from ARB are assessed for performance and compliance for functionality and safety. ARB Bull Bars are premium products that are engineered and manufactured to superior standards to not only be optimally functional but also to complement your 4WD’s aesthetics. We also offer Commercial Bull Bars, Under-Vehicle Protection, and Smart Bars. At ARB Maroochydore, we stock and sell a range of Bull Bars to suit your needs, from nudge bars for smaller Utes and SUVs to our sleek and appealing Summit, Sahara and Deluxe styles for 4WD vehicles. Each and every steel Bull Bar we sell is designed to complement individual vehicle models perfectly, and each is finished in a durable powder coat with optional paint colour coding for a perfectly integrated result. ARB Maroochydore is very proud to be the largest supplier of 4WD parts and accessories on the Sunshine Coast. The team are delighted to offer personalised, expert advice and service in all aspects of 4WD and outdoor adventuring within Australia. Please give us a call or come to visit us at our Maroochydore store to discover our full range of 4WD parts and accessories as well as our range of camping and touring accessories. We’re very happy to offer guidance and advice! Contact us today via phone or online enquiry form. Summer holidays in Australia are the time for vacations and long-distance travelling, especially camping and 4WD trips. Your vehicle’s 4WD suspension needs to be optimal and if you’re planning on travelling with a heavy load or taking your vehicle off-road, then it’s a great time to consider upgrading your suspension. Keeps the wheels in contact with the surface of the road as much as possible. Protects the vehicle and its cargo from damage. Optimises vehicle performance in an array of conditions. Most 4WD vehicles are sold new with a suspension that is tuned for driver and passenger comfort on smooth roads above all else. It may be great for cruising on the road or for carrying only very light loads, but once cargo or accessory weight is added to the vehicle, or if conditions on the road deteriorate, the reliability and performance of the vehicle can be diminished with standard, manufacturer-issue suspension systems. This is where, even on a new 4WD, a suspension upgrade can be a great idea. High-quality aftermarket suspension upgrades result in better overall performance of your vehicle – and for off-road driving or heavy loads, the standard suspension may not be adequate. Suspension upgrades for 4WD usually involve raising suspension by up to 50mm. Standard springs are replaced with customised springs and these depend on factors such as the presence of a bull bar, constant rear weight, and winch. Shock absorbers are also installed for better results. A suspension Lift Kit is used to modify a vehicle to raise its ride height. This improves the performance of the vehicle when taken off-road, however, it can also be installed for aesthetic reasons. With the use of a lift kit, the vehicle can be enabled for a steeper approach and departure, higher ground clearance, and to allow for fitting of larger wheels and tyres. The centre of gravity of the vehicle is raised when a lift kit is installed. The higher ground clearance allows the vehicle to travel over rougher or rocky terrain without any fear of causing damage to the vehicle’s undercarriage. We are proud stockists and suppliers of Old Man Emu suspension systems. Old Man Emu 4WD suspension provides systems that are matched, tuned and integrated for the ultimate in control, load capability, safety and comfort. The range incorporates suspension fitting kits, spring liners, centre bolts, U bolts, springs, shock absorbers, bushes, and trim packers – in other words, everything you need! We are the largest supplier of 4WD parts and accessories on the Sunshine Coast. The team at ARB Maroochydore offer personalised, expert service and they are well-versed in all aspects of 4WD and outdoor adventuring in Australia. Please give us a call or, better still, come to visit us instore to explore our full range of 4WD and camping accessories and to have your queries answered. Contact us today. Canopies and ute lids are a great addition to your vehicle, offering advantages that include but are not limited to weatherproofing, increased security, and a more flexible storage space for whatever type of cargo you transport. Not only this, but the right canopy will dramatically enhance the appearance and appeal of your vehicle, adding both functional and monetary value to your investment. Why Add a Canopy to your Ute? Whether you use your ute for commercial purposes or for recreation, there are huge benefits to be gained by investing in and installing a canopy. All of the advantages of owning a ute are enhanced, including superior security, the better functionality of your vehicle, enhanced safety for you, your cargo, and others while on the road, and a more aesthetically pleasing result. Here at ARB Maroochydore, our canopies and ute lids are built to the highest standards to be both tough and durable, and have been proven time and again to be reliable, even within Australia’s harshest climate conditions. ARB canopies are manufactured to the highest quality from UV-stable ABS thermoplastic. What is this? Formally named Acrylonitrile Butadiene Styrene, it is an opaque thermoplastic that can be heated and moulded as needed. It is corrosive-resistant, relatively inexpensive, and is commonly used for an array of applications including everything from computer keyboard keys, wall socket face guards, and power tool housing, to LEGO toys. Use of ABS thermoplastic to manufacture our ute canopies provides a dependable and durable solution for your vehicle that will last for many years. ARB canopies and ute covers are sold with after-sales support as well as a 3 year, 60,000km warranty Australia-wide. The Ascent Canopy is the newest addition to the ARB canopy range. Our flagship canopy product, it is a premium-designed canopy with a wide variety of features, including but not limited to push-button window switches, integrated central locking, venting, LED interior light, tinted safety glass, frameless windows, anti-entrapment dial, rear spoiler, and an electronic unlatching system. It’s an aesthetically pleasing and easy to use addition to your vehicle. The ARB Classic Canopy is a high quality, high-value canopy which offers a wide range of options for customisation for use with a comprehensive selection of roof racks and roof bars. Standard canopies are ideal for dual cab models in finishes of either grained hard-wearing or smooth exterior. There are high roof variants available for a dual cab or extra cab model vehicles in a textured finish. Features include LED brake light, lift-up rear door and front window, weatherproof design, double-locking handles, durable mounting system, internal light, and premium tint on windows. Why Choose ARB Maroochydore for Canopies? For premium canopies or related products for your vehicle, look no further than the great range at ARB Maroochydore. We are the Sunshine Coast’s largest supplier of 4WD accessories, with personalised service from the sales team. Our friendly team have extensive personal experience of remote 4WD camping and adventuring in Australia and deliver unparalleled knowledge and expertise to really help you choose exactly what you need for your own outdoor adventures. Our focus and commitment are to always provide exceptional customer service with integrity, reliability and professionalism. Please browse our website or come to visit us instore to discover our full range of canopies and other vehicle accessories for yourself. For answers to your questions or for a no-obligation quote, please contact us today via phone or online enquiry form. Alternatively, come to see us instore! We look forward to seeing you. Seventy years ago Arthur Warn started Warn Industries with a set of locking hubs for surplus WWII Jeeps. Over the next seven decades, the company would pioneer the electric winch, supply automakers with OE parts, create the powersports winch market, and design a host of innovative state-of-the-art products that let 4WD and powersports enthusiasts “go prepared”. That’s cause for celebration. ARB 4×4 Accessories partnered with Warn Industries in the early 1980’s as an official Australian distributor of WARN winches. With WARN’s long history in 4×4 accessories and ARB’s vast network and experience in Australian distribution, the partnership was an obvious choice. To celebrate the milestone anniversary, WARN has created a special limited-edition winch based on the iconic “upright” WARN winch design. The unique product will feature upgraded performance, Spydura® synthetic rope, distinctive styling and commemorative 70th Anniversary badging. Warn Industries will release more details about the M8274-70 and how you can win one in the coming months. Supporting their anniversary, ARB is giving away a variety of 70th anniversary apparel to customers throughout the coming months. Hoodies, caps and t-shirts are all up for grabs so follow @ARB4x4 on Instagram and Facebook for your chance to win. Starting in July, Warn Industries will be holding weekly trivia contests based around the company’s history on its Instagram (@warnindustries) and Facebook (@WARNfans) pages. Each week a winner will receive a WARN Prize Pack that includes an assortment of 70th Anniversary gear. The winner of each week’s trivia contest will be entered into a grand prize draw to win a WARN truck winch in Q4. However, this isn’t just any truck winch — it will be the upcoming limited-edition WARN M8274-70. Warn Industries is the world’s most recognised brand in off road products such as hub locks and vehicle recovery winches. The company designs, manufactures and markets a full line of off road equipment and accessories that enhance the performance of 4WD and powersport vehicles. Warn Industries is headquartered near Portland, Oregon. A roof rack is a great addition to your vehicle. It is a versatile accessory that dramatically opens up your options for where you can go and what you can do, enabling you to carry so much more. After installing the right roof rack, you’ll wonder how you lived without it... and Rhino Racks on the Sunshine Coast are among the best! You don’t have to be an avid viewer of The Big Bang Theory to know that physics plays a big part in most of our day to day lives; and when applied to the 4WD world, it is reasonable to expect that a 2.5t vehicle might struggle to maintain its traction in fine, soft sand and muddy terrains. To combat trouble when you lose traction, ARB has partnered with TRED to bring exclusive ARB TRED Pro recovery tracks to their stores. TRED offers an Australian owned and manufactured product and were the first to introduce a lifetime warranty. TRED Pro’s unique patented EXOTRED dual composite design comprises of multiple moulding processes and materials resulting in a flexible board fitted with a glass-filled nylon nodules which offer far greater resistance to melting under the heat and pressure of wheel spin. The transitioning convex to concave construction of the board allows the TRED Pro to wrap around the tyre early in the recovery process; ensuring ultimate coverage to gain traction whilst the later convex shape provides the tyre a sturdy platform to rise out and continue along a flat surface. Complementing the construction of the board is the precisely placed nodules which are spaced to match a large range of popular 4WD tread patterns and provide optimal grip. TRED Pro for ARB is offered in an exclusive range of colours (black on black or and black with recovery orange nodules) and includes a premium leash set for quick recovery of boards after use. No good story ended with ‘nothing went wrong along the way’. A story worth telling is often the result of the misfortunes that happen on the journey. Being prepared for when things go wrong is vital to any off road adventure, and being prepared starts with recovery equipment. With innovation at the forefront of its business mantra, ARB introduces you to Jack; Not a new member to the engineering team, but rather the outcome of a group of engineers being challenged to bring the latest in hydraulic technology to the recovery space. JACK; with no holds barred, is ARB’s new off road long-travel hydraulic jack. Not only is it a visually stunning piece of equipment, the functionality and safety benefits over the common mechanical jack are hard to ignore. From the moment JACK hits the ground, its sturdy pivot base can be rotated a full 360 degrees for optimal placement on unstable grounds. The forged aluminium hook can be quickly and easily locked into one of 9 hooking points on the extruded outer body of JACK. Once a connection is made between JACK’s hook and a dedicated lifting point on the vehicle, each full effortless pump of the jack handle will raise the vehicle 13mm. At this point of recovery, a key benefit of JACK over mechanical jacks are the huge reduction in effort required to raise the vehicle. JACK’s ergonomic handle is positioned at the top of the jack allowing the operator to remain upright. The hydraulic design allows quick and short partial cycles of the handle rather than full strokes to achieve the same result. JACK has an approved working capacity of 2000kg and while short and compact, allowing storage in your 4WD drawer, JACK boasts an impressive lift height of 1230mm (48inch). When it comes time to return the vehicle to solid ground, JACK is fitted with a safe and simple release valve. The two-stage hydraulically controlled release system (at the touch of a lever), allows JACK to retract slowly for the first two thirds and quicker for the final third. The hydraulic release means there is no risk of a brutal handle recoil or load drop due to mechanical slip. So when it’s time to hit the tracks, JACK might be just the extra muscle you need to get you home again. Let’s face it, the overnight conditions we face across Australia can vary widely from freezing cold in the Red Centre to hot and balmy in the Top End. ARB’s SkyDome Swag has always offered brilliant comfort in the cold, and with the release of the new SkyDome Series II Swag, it’s now even more suitable to the variety of climates we traverse across our great land. With the addition of two new midge-proof mesh windows, air flow is now better than ever for those summer nights.